Bulgarians shake their heads from the left to the right to express "YES". However, this stands for "NO" in the rest of the world. All electrical appliances work on ~ 220V. Many local and international banks and currency exchange offices function in the capital and around the country. Bank working hours are: 9 a.m. - 18 p.m., Monday to Friday. Some banks work on Saturday as well. Currency exchange offices are open to 6 p.m., some work 24 hours a day. Currency exchange is available also at the airport on arrival or departure, and in the big hotels. The official monetary unit is called "LEV" (plural "LEVA"). The banknote denominations include 1, 2, 5, 10, 20, and 50 LEVA, as well as coins- 1, 2, 5,10, 20, 50 called "stotinki" ("stotinka" for singular). 1 LEV coin is also available. Public transport in the big cities: tram, trolley bus and bus. Inter-city transport : plane, train, coach. Local and long distance bus services cover 90% of Bulgaria's settlements. Tickets can be purchased from travel and tourist agencies or at the bus stations. 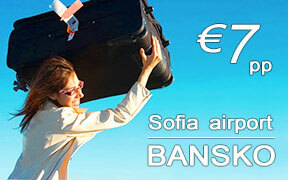 Taxi service : available at Sofia Airport and in every larger city in Bulgaria. You can rent a car from international rent-a-car companies such as AVIS, Hertz, Budget , Eurocar, etc. We offer discount car rentals at all major airports in Bulgaria - Sofia airport, Bourgas airport, Varna airport, Plovdiv airport. Common custom declarations and restrictions are applied for import and export of currency, food, alcohol and goods. There is a special custom regime for antiquarian objects, historic and cultural treasures, medicines,narcotics, weapons, ammunitions. 90% of Bulgarian people are Orthodox Christians and celebrate the traditional Christian holidays - Christmas, Easter and the name days of Bulgarians named after Archangels, Saints and Martyrs. About 8% are Muslims and a few are gypsies. Bulgarian people are very obliging and hospitable. Bulgarian food is close to the traditional European cuisine. Traditional Bulgarian menu includes bread, yogurt and fresh milk,cheese, tomatoes, paprika, potatoes, onions, beans and fruits, grappa and red or white wine. Crème Caramel - delicious dessert prepared from fresh milk, eggs and caramelized sugar, similar to the classic French crème brulee. Wide variety of cuisines is offered. Along with traditional Bulgarian dishes,many restaurants offer Italian, French, Greek, Chinese, German, Arabian,Hungarian, Latin American, Indian and Russian food. You can buy alcohol from a local store or pavilion on the street. Some of them work 24/7. Local and international telephone services are covered through automatic street telephones operating with tokens and calling cards. Tokens for local calls (0.20 leva) and calling cards are available for purchase from any post office. You can also make a phone call from almost every post office on the territory of the country. Postal services don't differ particularly from the ones in Europe or North America. Free Wi-Fi Internet is offered at all major petrol stations, pubs, restaurants and public areas throughout the country. Tourists to Bulgaria from many countries do not need visa - a valid passport is required only. All visitors, however, are themselves responsible to go through a visa application if a visa is required. To seethe list of countries that don't need visa to Bulgaria click here. Visa, MasterCard, American Express, Diners Club, Access, Airplus. They can be used for payment of all standard services in hotels,restaurants, night clubs, shops, car rentals, travel agencies, etc. Bulgaria has an extensive accommodation network ranging from luxury five-star to unpretentious two-star hotels, meeting all modern requirements. Reservations can be made through tourist agencies or local accommodation offices. One can enjoy a wide variety of fine dining almost everywhere - from the small country villages to the high-volume resorts. In addition, the numerous night clubs and theaters can delightfully compliment your visit to Bulgaria making the most of it.